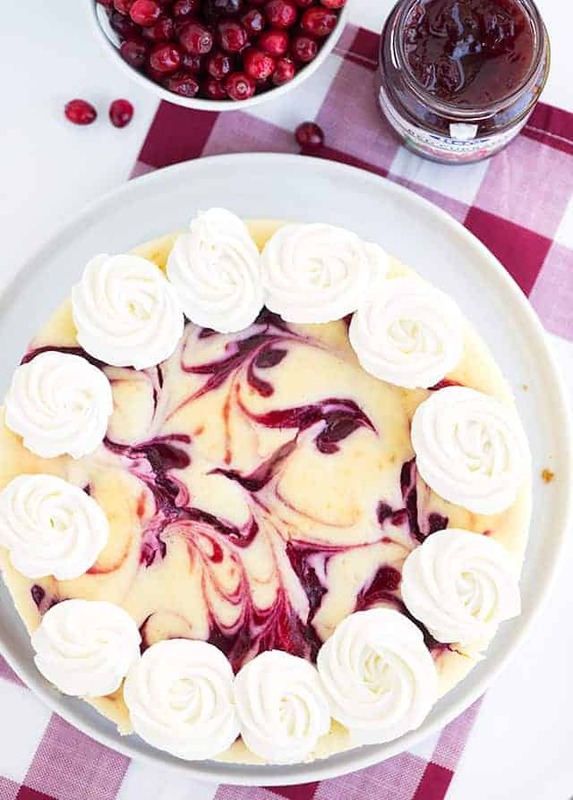 This cranberry red currant cheesecake is the perfect holiday cheesecake! It has beautiful swirls of cranberry red currant sauce. 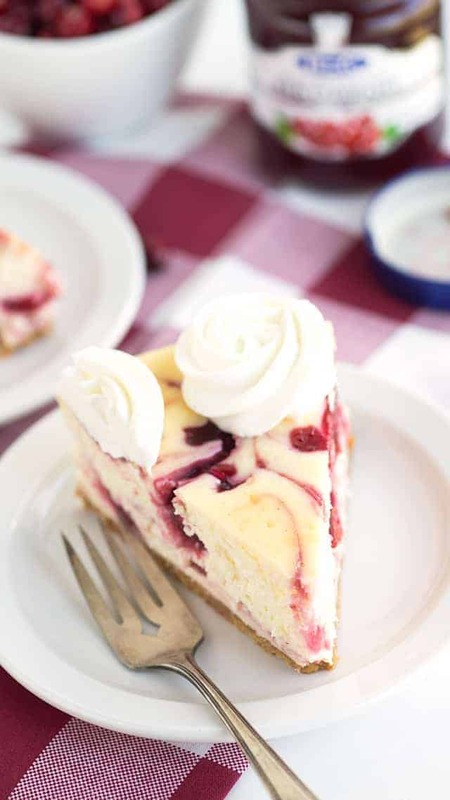 The cheesecake is sweet, creamy and with a hint of vanilla and the cranberry red currant sauce is slightly tart and a fantastic texture. This post is sponsored by Hero Fruit Spreads. As always, the opinions and content are my own. When I was thinking of holiday desserts to make, I instantly thought of something to do with cranberries. I don’t know about you, but we have it at every holiday dinner, Easter included. My son and I are really big fans of it even if we mostly just eat it in gel form straight out of the can. 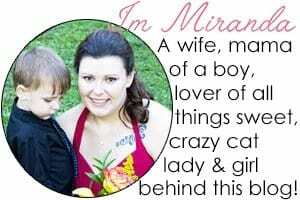 Did I just hear a gasp from a reader? Well, this cheesecake doesn’t have the canned cranberry sauce in it, so if it was you that was gasping, don’t worry. I cooked the cranberries with some Hero red currant fruit spread to make the sauce. The tart duo go amazing together in the cheesecake. These Hero Fruit Spreads are fantastic! They have such a unique variety of flavors like red currant, black currant, bitter orange, and forest berry, but also some better-known flavors like black cherry, blueberry, blackberry, red raspberry and more. The best part is you can find it in your jam aisle at your local supermarket. Fancy grocery stores are not required. Maybe they should be though! Professional Chefs use and prefer Hero Fruit Spreads because of a legacy of authentic goodness which makes total sense. There is no artificial color OR flavor in this fruit spread. It has no high fructose corn syrup or preservatives either. Lastly, it’s Kosher Union approved! Hero was established in 1886 in the quaint village of Lenzburg, Switzerland and has since become the gold standard of Gourmet Fruit Spreads around the world. I adore this cheesecake! I’ve shared it with my good friends that are in town because sharing is caring! 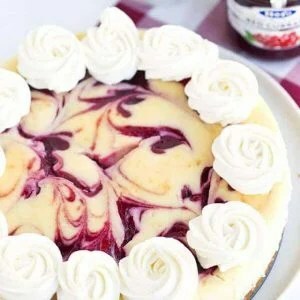 I thought that it would be hard to get people to try the cheesecake, but it’s so pretty that everyone wants to give it a try. It’s totally worth the risk because you’ll never want to go back to regular cheesecake afterward. I really like the streaks and pockets of cranberry red currant flavor as does everyone else that has tried it. In a medium saucepan, add in the sugar and cornstarch. Stir to combine. Add in the fresh cranberries, red currant fruit spread, and water. Place over medium heat and stir. Let cook about 9 - 10 minutes until the cranberries pop open. Using a food processor or blender, blend the hot mixture for about 1 minute. (You can skip this step, but I prefer to do it. Using a sieve, strain out any remaining skins or seeds from the sauce. Set aside and start working on the crust and cheesecake. Mix the graham cracker crumbs, melted butter, and sugar until it resembles wet sand and can be packed down. Press the crust into a 9 inch spring form pan. Place in the oven for 10 minutes. Remove from the oven and let cool. In a mixing bowl, add in the cream cheese. Beat on medium until the cream cheese is smooth. Scrape down the bowl. Add in the sugar and beat on medium again until incorporated. Scrape down the sides and bottom of the bowl. Add in the eggs one at a time until they are all incorporated. Scrape down the sides and bottom of the bowl. Add in the sour cream, heavy cream, and vanilla extract. Beat on medium until the mixture comes together. It will be runny. Pour half of the batter into the prepared pan on top of the crust. The crust doesn't have to be cooled completely. Drizzle about half of the cranberry red currant sauce on top of cheesecake batter. Using a toothpick or skewer, swirl it around. Pour the remaining cheesecake batter into the pan. I did reserve about 3 tablespoons of the cheesecake batter to go on top of the final pouring of the cranberry sauce. 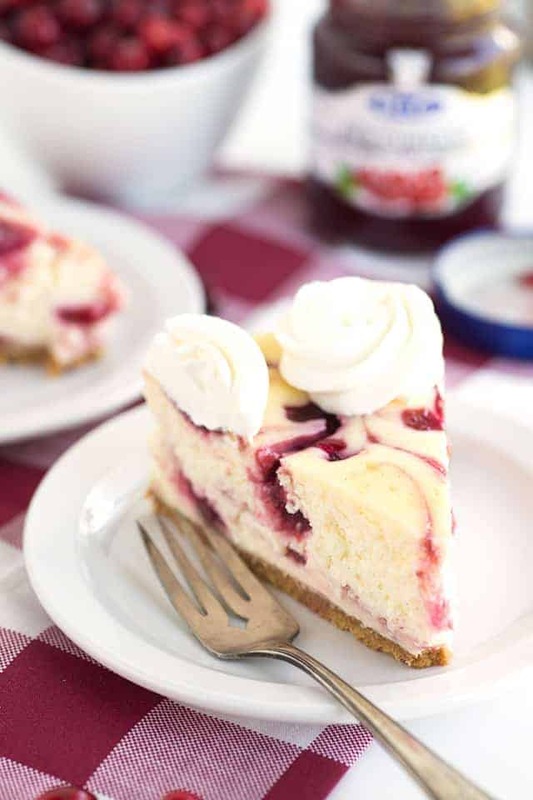 Drizzle the cranberry red currant sauce evenly on the cheesecake. Drizzle the reserved 3 tablespoons of cheesecake batter on top of the sauce to help break it up. 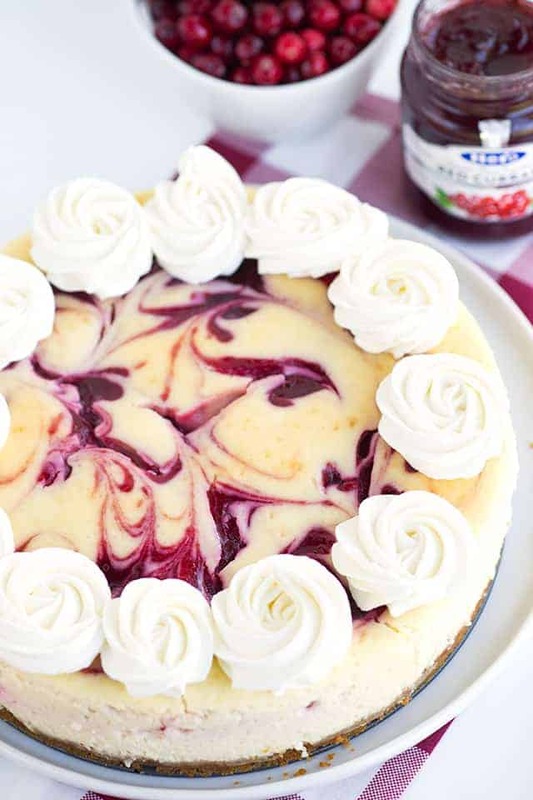 Using a toothpick or skewer, swirl the sauce into the cheesecake. Wrap the bottom of the spring form pan with tin foil. Place the cheesecake into a slightly bigger pan and fill with an inch to two inches of hot water. Make sure the tin foil protects the cheesecake so water doesn't leak into it. Place in the oven with a tented piece of tin foil over the top of the cheesecake to prevent browning on the top. Let the cheesecake bake for 1 hour 20 minutes - 1 hour 30 minutes until done. 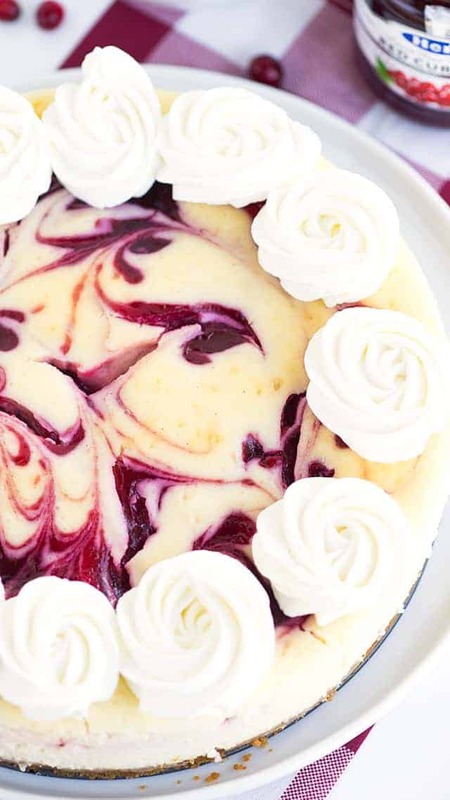 To make sure the cheesecake is done, give it a wiggle. If it slightly jiggles in JUST the middle like jello, then it's done. If it jiggles all over, it needs to bake longer. Turn off the heat and crack the oven door slightly. Let it cool in the oven. I kept mine in the oven for about 4-5 hours and then placed it in the fridge. Add whipped cream into a piping bag fitted with a 1M tip. Pipe swirls on top of the cooled cheesecake. Find Hero fruit spreads in the jam aisle at Shop Rite, Stop & Shop, ACME, Key Food, Kings, Balducci’s, Market Basket, Price Chopper, Ralph’s, HEB, Harris Teeter, Giant Eagle and more! Find out more about each of the flavors at https://www.herofruitspreads.com/home/flavors.